•Designed to produce disposable gloves for food handle or any bag with irregular shape. •Can be two molds to have more production. 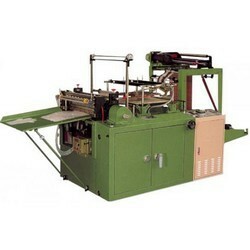 •Purchasing optional double cutter, conveyor & heat needle devices can produce flat bags in the same machine to let the machine have several functions like flat bags, glove bags & irregular bags. •Optional servo motor for better length adjustment & easier operation. Bag width 18" or 9"+9" 26" or 13"+13"
Output depending on bag width, length, thickness & raw material. For more details specification, special requirements & quotation, please kindly contact us.